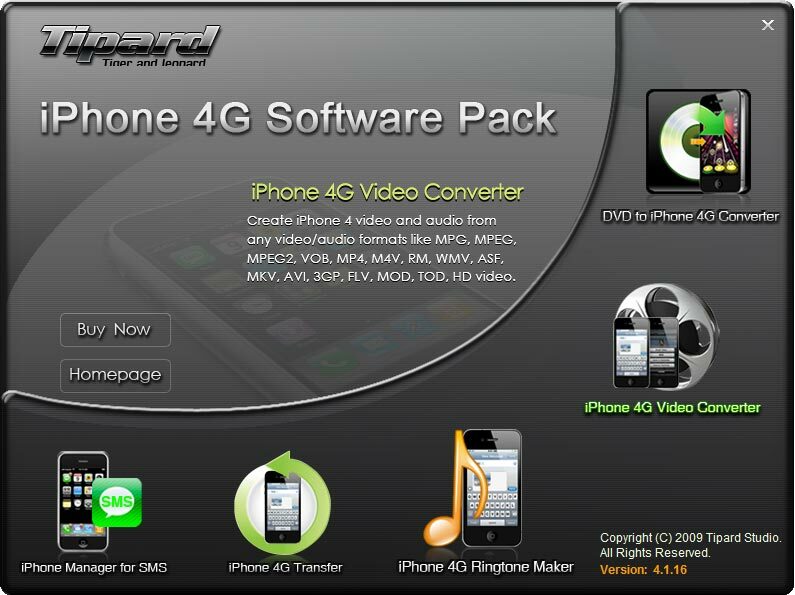 Tipard iPhone 4G Software Pack has integrated DVD to iPhone 4G Converter, iPhone 4G Video Converter, iPhone 4G Transfer, iPhone 4G Ringtone Maker, and iPhone Manager for SMS. The powerful iPhone 4G software can rip DVD to iPhone 4 MP4, H.264 (.mp4), and MOV, convert video to iPhone 4, create iPhone 4G ringtone, backup iPhone 4 videos/audios to PC, export files from PC to iPhone 4, and manage iPhone 4 SMS. ...... convert/rip DVD to iPhone 4 MP4, H.264 (.mp4), MOV video and MP3, M4A, WAV audio. You are able to convert HD videos, SWF, FLV, VOB, MOD, MP4, M4V, AVI, WMV, 3GP, QuickTime Video, DV, MJPG, MJPEG, MPV, MPEG, MPEG2, MPG, etc. to iPhone 4 video and audio format. Powerful iPhone 4 Software Pack can assist you to make your own iPhone 4 ringtone with any videos or audios. This iPhone 4G Software Pack enables you to transfer iPhone 4 files to PC and transfer local files to iPhone 4. Also you can copy, backup and manage your iPhone 4 SMS. Qweas is providing links to iPhone 4G Software Pack 4.1.28 as a courtesy, and makes no representations regarding iPhone 4G Software Pack or any other applications or any information related thereto. Any questions, complaints or claims regarding this application iPhone 4G Software Pack 4.1.28 must be directed to the appropriate software vendor. You may click the publisher link of iPhone 4G Software Pack on the top of this page to get more details about the vendor.